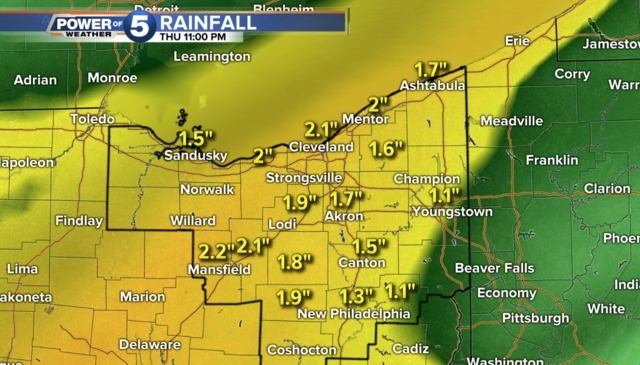 A Flood Watch has been issued for Northeast Ohio on Thursday. Moderate to heavy rainfall is expected Thursday afternoon into tonight, bringing a two-day rain total to 1.5 to 2.5 inches. The Flood Watch will be in effect from Thursday at 8 a.m. to 10 a.m. on Friday. The rain can cause more problems than usual as fall leaves may clutter storm drains and water drainage areas. There will be elevated water levels on the western and central lakeshore, according to the National Weather Service. As you head out on the roads, be aware of wet leaves that can cause very slippery conditions.